What’s next for the Turkish Lira after its violent sell-off? 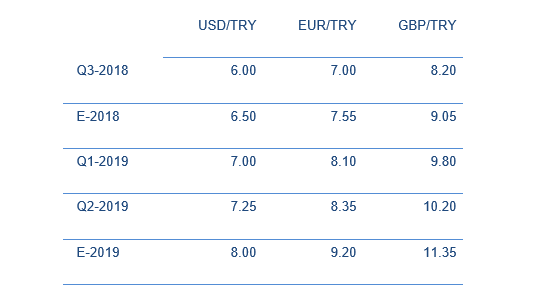 The Turkish Lira (TRY) sold-off violently at the end of last week, extending its slide to around 40% since the beginning of the year and emerging as the worst performing free-floating currency in the world in 2018.
he currency was sent into freefall on Friday 10th August, crashing by over 20% to a fresh record low level during a frantic session of trading that wreaked havoc in the foreign exchange markets (Figure 1). The Lira experienced its longest run of consecutive daily losses in twenty years, with the currency’s near 50% drop on the twelve months previous the largest 52-week decline of any G20 currency in the past decade. It reached lows below 7 to the Dollar before rebounding to above 6 after Turkish authorities restricted the ability of offshore players to short the currency. While large fluctuations among emerging market currencies are nothing new, the scale of the Turkish currency slide has rarely been seen in recent years. What is behind the Lira’s sharp sell-off and what impact has this dramatic move had on the global currency markets? 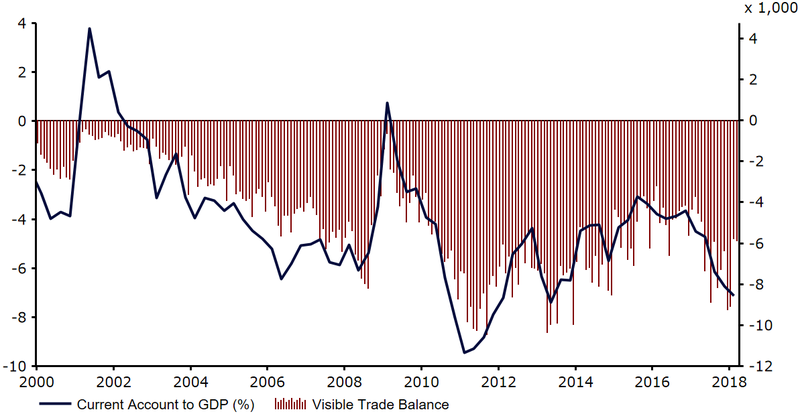 a) Large current account deficit: While Turkey’s economy has been one of the fastest growing in the world in recent years, much of this expansion has been fuelled largely by foreign currency debt. The real estate and consumption boom fueled imports and a hefty current account deficit, which ballooned to 7.1% of overall GDP in the first quarter of the year (Figure 2). b) Banking system and corporations indebted in hard currency: Turkey’s increased use of foreign loans to fuel Erdogan’s growth drive has become a serious issue for the country’s banking sector as well as large corporations, following the sharp depreciation in TRY. Investors have grown increasingly concerned that entities from Turkey that failed to hedge their currency risk may now have major problems repaying loans from foreign institutions, many of which lie in the Eurozone. A weaker Lira automatically increases the actual size of Turkey’s external debt obligations, which could conceivably lead to the banks and corporations defaulting. 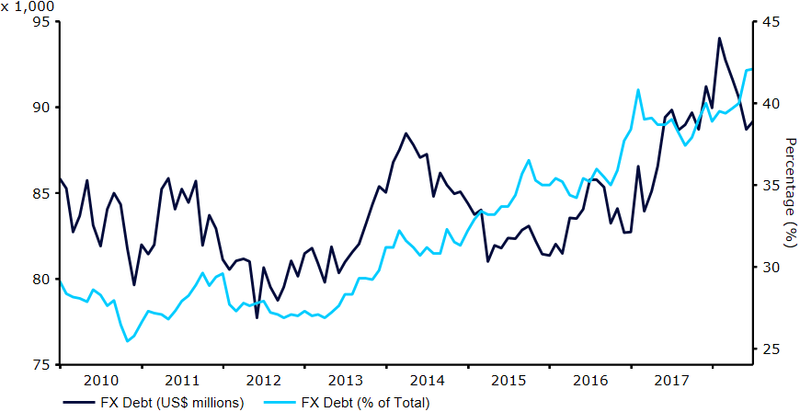 Gross FX-denominated debt was the equivalent of a massive 69.5% of GDP in Turkey last year, the highest among the main emerging market economies. External FX debt now also accounts for around 40% of total liabilities (Figure 3). 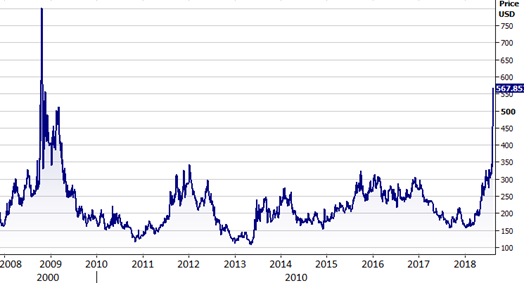 A good gauge of investor concerns regarding default is the value of the country’s five year Credit Default Swaps (CDS), which jumped by around 300 basis points to above 590 (Figure 4). This marked the highest level in the measure since the global financial crisis in 2008.
c) Low foreign exchange reserves: Turkey’s FX reserves have been declining at an accelerated rate this year, due in part to the need to pay for imported oil in USD, and are currently at the equivalent of just four months’ worth of import cover (Figure 5). This is now perilously close to the level deemed as insufficient by the IMF and an inadequate level to finance the country’s large current account deficit. It also provides very little room for the central bank to directly intervene in the market to protect the Lira. The loss of independence of the country’s central bank has significantly hindered Turkey’s efforts to rein in spiralling inflation and protect the Lira. The depreciation in the Lira has forced domestic prices higher in the past few months, as is generally the case when a currency experiences such a sharp sell-off. The headline rate of inflation jumped to almost 16% in annual terms in July (Figure 6), its highest level in fourteen years and way above the central bank’s 3-7% target range. This will almost inevitably trend higher in the coming months. Under conventional circumstances, sky-high inflation and a free-falling currency would encourage the country’s central bank to aggressively raise interest rates. The central bank has, however, long been at odds with President Erdogan, a self- described ‘enemy of interest rates’, who has persistently called for lower rates in Turkey to fuel credit growth and economic expansion. Erdogan has even argued bizarrely that it is high rates themselves that cause inflation. The CBRT has instead largely been forced to use a number of tools in an attempt to prop up the currency, aside from injecting liquidity into the financial sector, although these measures have had little effect on the Lira. President Erdogan has pledged to provide ‘all the liquidity the banks need’. 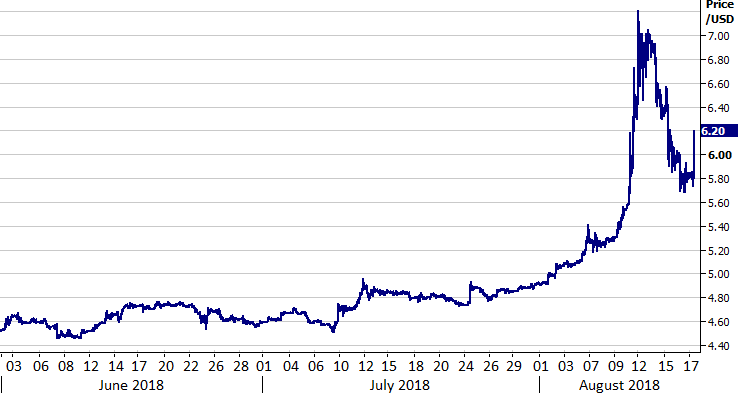 The latest measures restricting short selling of the Lira seem to have had some stabilising effect. Nonetheless, there is serious doubt in the market that authorities in Turkey have the capacity to raise interest rates under such heavy political pressure. Erdogan’s confrontational brand of authoritarianism has alienated many of Turkey’s closest allies, most notably significantly souring relations with the US. Worsening relations between Turkey and the US, one of the country’s largest trading partners, has been one of the primary drivers behind the hammering of the Lira so far in 2018. The detention of American pastor Andrew Brunson, accused of espionage and links to terror groups that were involved in the failed coup attempt in Turkey in 2016, has angered the Trump administration and contributed to the imposition of sanctions from the US President on the country’s justice and interior ministers earlier this month. To exacerbate matters, Trump announced on Friday that he was greenlighting a doubling of tariffs on Turkish steel and aluminium imports to 50% and 20% respectively, citing in a tweet a weaker Lira and poor relations between the two countries. President Erdogan and his financial advisers appear to be losing control of the situation and his increasingly bizarre and unhelpful statements have not calmed financial markets. How has the sell-off impacted the global currency markets? As is customary during times of intense market uncertainty, investors flocked to the safe-haven US Dollar, Japanese Yen and Swiss Franc. Investors also fled higher risk emerging market currencies, many of which fell to multi-month or multi-year lows, notably the Russian Ruble and South African Rand. We do, however, think that the move in the Lira was entirely due to idiosyncratic factors and that those emerging market currencies that did sell-off should begin to initiate a rebound. The US Dollar has strengthened to a more than one year high against Sterling, while rallying sharply below the 1.14 mark against the Euro for the first time since July 2017. What’s next for Turkey and the Lira? We find it hard to see a definitive bottom to the Lira’s recent sell-off and see additional losses for the currency as likely. 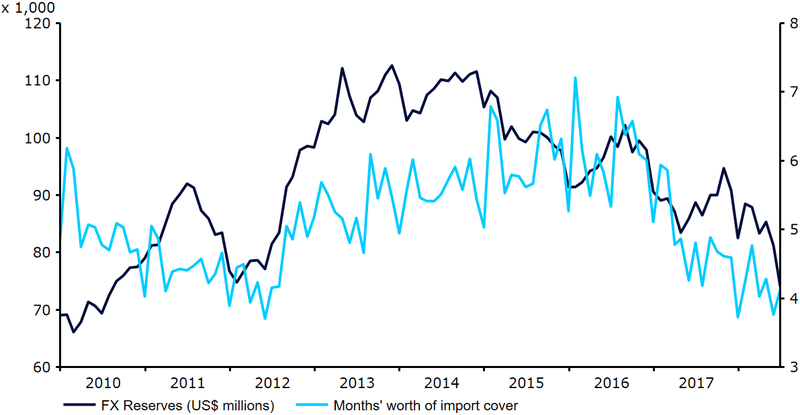 One positive of the situation is that the banks seem to have sufficient FX liquidity to cover their hard currency maturities for a few months yet. The CBRT has, however, not directly intervened in the market, barring some verbal assurances, and continues to appear unwilling and unable to hike rates further. Even if the bank were to hike again, there’s no guarantee that another rate increase would provide anything more than temporary support for the currency, as has been the case in the recent past. Speaking in a conference call with Turkish investors and economists on Thursday, Finance Minister Berat Albayrak ruled out the possibility of imposing capital controls that would lead to a sudden stop in trade flows and investment. He also stated that there were no plans to seek financial support from the IMF and that the country will instead target tighter fiscal policy and increased FDI. 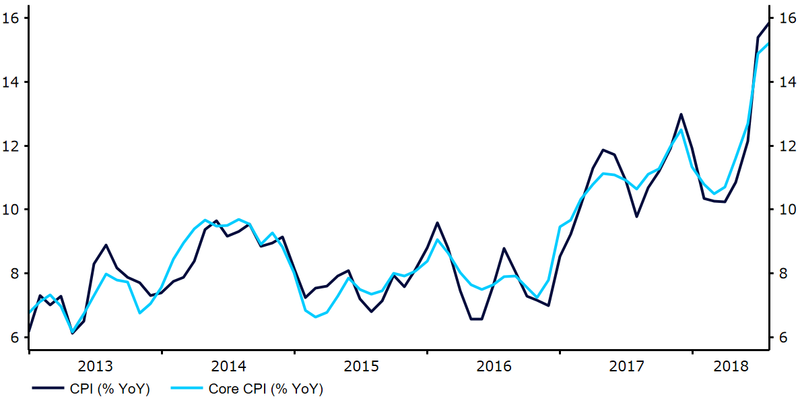 We do, however, think that even the combination of government austerity measures and large interest rate hikes from the central bank may be insufficient to rein in inflation and the Lira, and a rescue package from the IMF further down the line cannot be ruled out. Going forward, currency traders will be bracing for more wild swings in the Lira and keeping tabs on the possibility of contagion that could drag other European currencies with it. We think that the currency will be able to maintain relative stability in the short term around current levels as Turkish authorities continue to squeeze short sellers with emergency measures. As time passes, we see it difficult to see anything but additional losses for the Lira against every other currency as more and more Turkish institutions default on their existing FX loans.